I always like introducing you to artists who are not on the radar in mainstream art history. I know, there are so many, so where do I start? In one of my little “epiphany moments” of sorts, this week I was privileged to add works to our collection by Ogata Gekko, a Japanese printmaker of the late 19th to early 20th century. Now, we all know that Japanese prints influenced European art, particularly Impressionism, starting in the 1860s. However, the prints that influenced European artists were from the 18th and early 19th centuries, for example, Hokusai. While Impressionism and Post-Impressionism were benefiting from the influence of Japanese prints from earlier periods, Gekko was continuing the tradition in a new direction. The Meiji “restoration” of 1867 ended over 200 years of the feudal dictatorship of the Tokugawa shogunate. Under the guise of once again “revering the emperor” as the supreme ruler, certain military families methodically transformed Japan, at an astonishingly fast rate, into a modern, westernized, industrial country. This all occurred after Japan was forcibly opened to western trade by Commodore Perry of the United States. With that opening to western trade, Japanese artists were able to see art from Western Europe more than ever before. Many western influences crept into Japanese prints, including the illusion of depth, monumentality of form, and western chemical aniline dyes imported from Germany. Ogata Gekko was somewhat of an anomaly compared to past artists in the woodcut print field. He does not appear to have done the traditional apprenticeship to a master artist, and apparently was self-taught. His early career was as an illustrator and designer of advertisements. Influenced by traditional Chinese painting, his early career as an artist was as a painter, illustrator, and decorator of lacquer work. In the 1880s he became interested in printmaking in the Ukiyo-e style. While the historical Ukiyo-e style produced subjects of beauties, actors and landscapes, Gekko preferred genre subjects, landscapes, and particularly animals and plants. Among his favored subject matter was the depiction of animals in grassy settings. Gekko’s style was unique in woodblock printing because he eschewed the strict linearity of earlier Ukiyo-e in favor of a style that imitated brush work. He must have driven his woodblock carvers and printers crazy with his technique. This print comes from a series of shishikiban (square prints), which were his favored format for depicting close-ups of nature. While this print contains traditional elements such as suggestions of depth with mist, open composition, and emphasis on minute elements of nature, there is a definite western influence on the insistence on three-dimensional space in the concentric ripples in the water, and the diminution of detail in the far background. Gekko was the first internationally acclaimed Japanese artist. He displayed his prints at the Chicago Columbian Exposition in 1893, the Paris World Exposition in 1900, and the International Exposition in London in 1910. At the 1903 Saint Louis’ World’s Fair, he received a medal for one of his prints. This website has an awesome amount of the varied work of this brilliant artist, plus extensive biographical information. 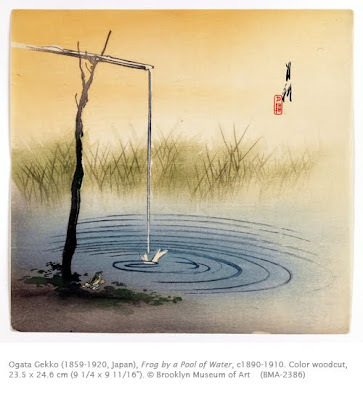 I have done some research on the issue of whether he received a gold medal for a print from his 100 Fuji woodblock print series at the St Louis world fair, unfortunately I can find no evidence that this was the case, although he did receive a silver medal for one of his paintings.